Dr. Li Lin, Head of CreditEase WM Asset Allocation Strategy Research, pointed out in the recently issued CreditEase WM 2019 Asset Allocation Strategy (hereinafter referred to as the “Strategy”) that investors should closely monitor two potential “turning points” of the global economy in 2019 : a decline in economic growth in the US, and a significant decline in net liquidity injection by major central banks. Dr Li believes that either could be a catalyst for contractionary effects on asset prices and market volatility. While the Chinese economy continues to be under pressure, there are still some areas showing signs of improvement, with domestic consumption making more contributions to overall GDP growth, and “new economy” sectors, including biomedicine, telecommunications and specialist digital equipment and etc. growing at a much faster pace than traditional industries. Dr. Li believes that the key to invest in China is to invest in the "new economy." Tang Ning, Founder and CEO of CreditEase, pointed out in the Strategy that in the new era, China has experienced many historic events which have had far-reaching impacts on each of us. He believes we should adjust our mindset and ability and enhance our understanding of finance and the economy, in order to keep up with or even lead the new era. He also believes the Yale Model should serve as an important reference for high net worth (HNW) individuals when making asset allocation. 2018 was a challenging year in the global markets, as most risky assets experienced a decline in prices, including a 29% drop in the A share market index. While saying goodbye to 2018 as a ‘lost’ year in investment markets, the Strategy points out that 2019 is likely to be an even more challengingyear. According to the Strategy, we are in the late stage of the economic cycle, and the momentum of growth has passed its peak. Meanwhile, the valuation of traditional assets stays high, and the volatility of open market is expected to remain high in 2019. There exists also plenty potential sources of uncertainties in 2019 including national economic policies, geopolitical conflicts, trade wars and elections in several countries. In the face of pessimistic market sentiment and high volatility, a key challenge for investors is how to carefully set risk, liquidity and yield objectives for themselves and their families, and meanwhile balance the risk in the market and uncertainties in investment..
CreditEase WM suggests that the investment model of Yale University Endowment should provide a good reference for investors. Over the past 30 years since establishment, the endowment has experienced four global economic crisis but all recorded positive gains, except for 2009 (net worth declined). Under the leadership of David Swensen, the endowment’s net worth has increased by nearly 20 times in 30 years, with an average annualized return of nearly 13%. What drives the Yale model ? A review of the Yale University Endowment annual reports reveals two key characteristics: firstly, the investment team focuses on long-term investment strategy and they prefer highly diversified investments; and secondly, they overweight alternative assets, rather than assets with low investment gains, such as bonds and commodities. According to annual reports since 2010, major asset classes allocated by the endowment include absolute return funds (hedge funds), US stocks (individual stocks), US bonds, global stocks (including both developed and emerging markets), private equity, natural resources, real estate and venture capital funds. The allocation of US stocks (individual stocks) and US bonds are both less than 5% of the total investment portfolio in recent years, while hedge funds remain at about 20%, and private equity-based assets (private equity and venture capital funds) have remained at more than 30% for a long time. Is the “Yale Model” replicable? Tang Ning believes that the “Yale Model” can be replicated by professional investors, through advanced technology and following the fundamental principles of asset allocation, especially the principles of a high allocation to equities and long-term investment in alternative assets. These principles have long been a cornerstone for CreditEase WM. In the 2017 Asset Allocation Strategy, CreditEase WM proposed “three golden principles of asset allocation”, as being (1) “multi-countries” (e.g. diversification across markets); (2) “multi-assets” (e.g. diversification across asset classes) and (3) high allocation to alternative assets via FOF (Fund of Funds)". Investors who followed these principles in 2017 were rewarded by double digit investment returns. CreditEase WM promoted a similar approach in its 2018 Asset Allocation Strategy and recommended that investors should increase allocations to alternative assets, in the face of potentially heightened market volatility. The 2018 guidance was for 25% allocation to private equity, 20% to public equities, 20% to real estate, 20% to domestic fixed income, 5% to overseas private credits and 10% to insurance. If strictly adhering to the guidance in 2018, investors could be rewarded with a positive weighted average return of approximately 2.1%, assuming median returns in each asset class on the basis of a conservative estimate, and allowing for FX movements. It was indeed difficult to stay safe from investment losses in the bleak investment climate of 2018, however, if implementing the allocation strategy via FOFs issued by CreditEase WM, investors could even reap an 8.1% return in 2018. Hou Lin, General Manager of CreditEase WM Finance Products, provided two explanations for the outperformance of CreditEase WM 2018 guidance. “Firstly, an overwhelming majority of liquid asset classes suffered in 2018 due to high market volatility, while in contrast, the performance of alternative assets such as private equity and real estate funds was stable. Allocating assets significantly to private and alternative markets was the key to avoiding losses in 2018”. Based on the above, sound asset allocation and using FOFs to overweight alternative assets are the key elements enabling investors in China to reference the Yale model. While the Yale model has generated excellent long-run returns, replicating this approach is not a simple exercise for individual investors, who lack the investment expertise and capacity of an institutional investor, and also have reduced access to investments and managers. CreditEase WM recommends that individual investors should work with professional organizations to execute on this strategy. CreditEase WM believes that fund manager selection is an important factor in investing in alternative assets, because their performance varies greatly. KKR’s survey data shows that the top alternative assets fund managers generate investment returns much higher than the industry averages, and significantly higher than that obtained by the bottom managers. Choosing excellent fund managers is one of the important considerations in investing in alternative assets, as contrasted with investing in traditional assets, where there is far less difference in outcomes achieved by top quartile, median and bottom quartile managers. Hou Lin suggested that high net worth investors should invest in alternative assets via FOFs that help investors access top quartile fund managers. She also pointed out that professional FOF managers are much better positioned than individual investors to formulate a long-term scientific approach to asset allocation and constantly optimize it, and to minimize maturity mismatch and the loss of premium headroom caused by the pursuit of short-term liquidity. According to Hou Lin, CreditEase WM has been building three core capabilities in the past 10 years based on the needs of HNW clients: investment capability, internationalization, and technology leadership. The development of these capabilities positions CreditEase WM well for the continued support of HNW clients with sound wealth management solutions. 8. The importance of insurance products will continue to grow, and investors are recommended to address under-insurance and focus on long-term policies and policies that will generate annuity returns in future. In addition, according to the Strategy, the demand for succession planning continues to grow in China. Family wealth that has historically been concentrated in single family enterprises and physical assets such as property, is being diversified across financial assets, as well as corporate equities and physical assets, and a holistic approach to succession planning, including consideration of family values and spirits, is becoming a mainstream requirement. 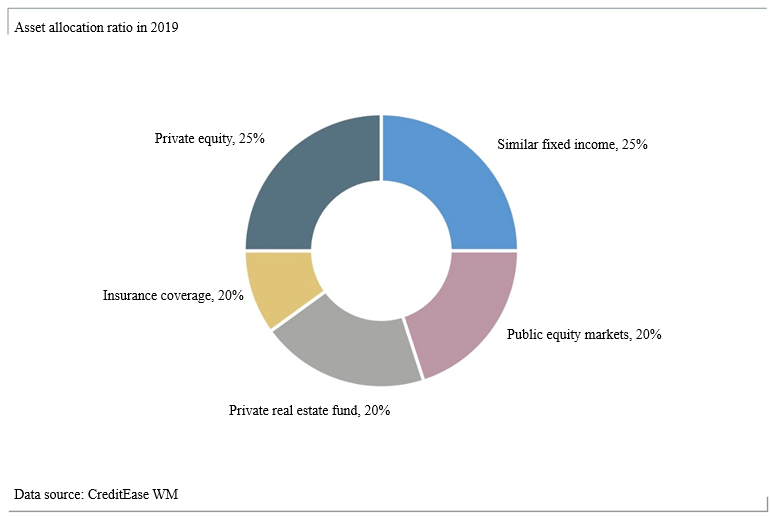 For 2019, CreditEase WM recommends the following asset allocation recommendations to high net worth individuals: 25% for private equity; 25% for fixed income; 10% for insurance; 20% for public equity markets; and 20% for real estate private equity.